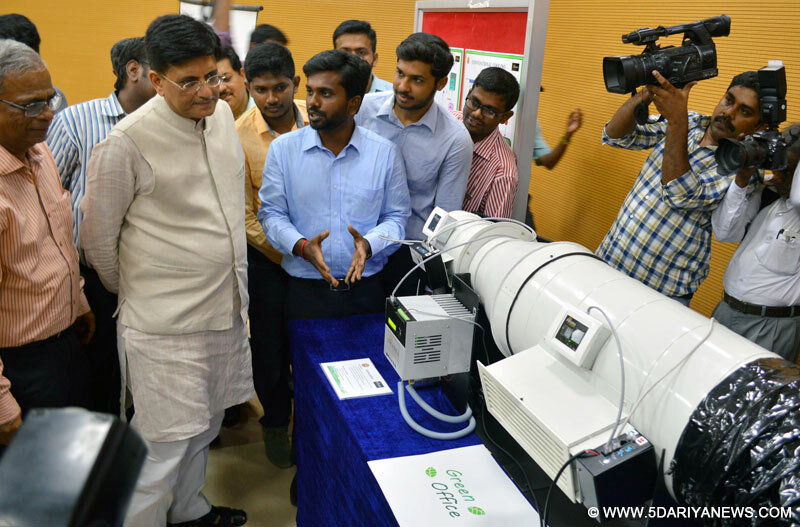 The Minister of State for Power, Coal, New and Renewable Energy and Mines (Independent Charge), Shri Piyush Goyal having a look at exhibits of Green Technology, at IIT Madras, Tamil Nadu on July 15, 2016. Piyush Goyal, Minister of State (IC) for Power, Coal, Mines and New & Renewable Energy said that the interface of solar technology with DC technology inspired me most. “It will help to secure energy security & provide green energy”, he said this after laying foundation stone for energy saving chilled water storage & centre for battery engineering & electric vehicles at the IIT-Chennai today. Shri Goyal further said that I believe this fusion of Solar Technology for providing green energy & energy security can be utilized for serving the under privileged & ultimately, the whole nation. Speaking on the occasion, Shri Goyal stated that India has the skill, knowledge, capacity to develop cutting edge green technology which would provide power to the weaker section of society. He emphasized that India has to innovate; it has to invest in R & D & promote young innovators. “This way, we can provide a way forward to the World”, the Minister added. Referring to innovative green technology research being undertaken at IIT Madras, the Minister said that this highlights a new kind of partnership made possible between Public-Private-Professor-People (PPPP). He said these technologies can make uninterrupted power accessible and affordable for the poor and aligns with the Government's commitment to make power available to every home in India. He said these technologies are a significant leap towards India achieving energy security goals. While replying to the questions of the media persons during press conference, Shri Goyal said that if Tamil Nadu signs the UDAY scheme, it will save over Rs.22,4000 crore in the next 3 years and a further saving of Rs. 7000 cr per year after 2019. He stressed upon the need of ‘Right of Way' being given to the projects by the State governments in order to make South India power surplus. Talking about transparent auctions, the Minister explained in detail the economies of scale being achieved in the Power sector. He quoted the example of Rajasthan where new tenders have been recently opened, which has led to a progressive decrease in the price of Solar Power to Rs. 4.35 per unit. Renewable energy is no more unviable today. “Its price is decreasing on a year-on-year basis unlike other conventional sources of power”, he said. The Minister expressed pride in telling the media that most of the power plants in India are power surplus today and the Government at the Centre is proactive in helping the power deficit States in meeting their power requirements. Listing the initiatives taken by the government to give thrust renewable energy, the minister said the centre has launched two pilot projects at Phalodi in Rajasthan and Sasar at a cost of 80 crore rupees to provide solar power to all households in these two areas. On the occasion, Shri Goyal also launched energy efficient LED tube light and bulbs as a part of green technology innovation at the IIT campus and visited solar power green house.